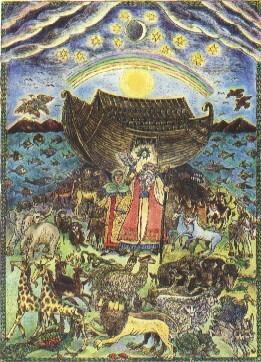 Guided by references found in Torah, and stories from the Aggadah (folklore portions of Talmud and Midrash), the image of "Noah and Naamah" may be seen as a visual allegory for Creation, for it weaves together elements formed in the first six days. 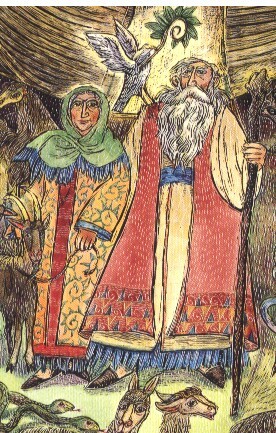 Having survived the forty days and forty nights of the Great Deluge aboard their immense gopherwood ship, the ancient couple, surrounded by a mundane and magical multitude of creatures are the progenitors of renewed life and civilization (Noah was said to be 498 years old when he and Naamah married and 600 years old at the time of the Flood.) As the inspiration for legends from the lands of our ancestors, Noah and Naamah also personify the hope of future generations on their journeys of discovery.